Contact Aeroinsul insulation contractors for professional advice on ceiling insulation and other types of insulation products. Aeroinsul is an Aerolite approved home installer. We will issue you with a certificate that will act as your 30 year guarantee on the thermal performance of the product. This certificate will also give you peace of mind that your installation has been done professionally. By being in possession of this certificate, it will add value to your home. Aerolite is made from pure spun glass, bonded with an inert thermo-setting resin to form a strong, resilient, easy to handle blanket. 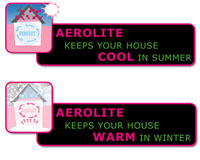 Aerolite forms a highly efficient thermal barrier, which excludes solar heat gain in summer and retains heat generated within a building in winter. It reduces heat flow by up to 87% and can lower the temperature in summer by up to 5 deg C.